I recently needed to update an old Android app that I hadn't touched in years. My Eclipse setup is way out of date, and I've been hearing about more and more projects switching to using command-line builds. I wanted to ditch my fiddly, difficult to install Eclipse setup and switch to something easier to use. Some of the big open-source packages, like OsmAnd, have switched to gradle for their Java builds. So I tried to install gradle -- and on Debian, apt-get install gradle wanted to pull in a total of 153 packages! Maybe gradle wasn't the best option to pursue. But there's another option for command-line android builds: ant. When I tried apt-get install ant, since I already have Java installed (I think the relevant package is openjdk-7-jdk), it installed without needing a single additional package. For a small program, that's clearly a better way to go! First install the Android "Stand-alone SDK Tools" from Installing the Android SDK. This requires a fair amount of clicking around, accepting licenses, and waiting for a long download. Now install an SDK or two. Use android sdk to install new SDK versions, and android list targets to see what versions you have installed. Adjust the Android target for the version you want to use. When this is done, type ant with no arguments to make sure the directory structure was created properly. If it doesn't print errors, that's a good sign. Check that local.properties has sdk.dir set correctly. It should have picked that up from your environment. There will be a stub source file in src/tld/yourdomain/YourProject.java. Edit it as needed, or, if you're transferring a project from another build system such as eclipse, copy the existing .java files to that directory. If you have custom icons for your project, or other resources like layout or menu files, put them in the appropriate directories under res. The directory structure is the same as in eclipse, but unlike an eclipse build, you can edit the files at any time without the build mysteriously breaking. Now you'll need a key to sign your app. Eclipse generates a debugging key automatically, but ant doesn't. It's better to use a real key anyway, since debugging keys expire and need to be regenerated periodically. It will ask you for a password; be sure to use one you won't forget (or record it somewhere). You can use any filename you want instead of my-key.keystore, and any alias you want instead of mykey. Some tutorials tell you to put this in build.properties, but that's outdated and no longer works. If you don't, you'll be prompted twice for the password (which echoes on the terminal, so be aware of that if anyone is bored enough to watch over your shoulder as you build packages. I guess build-signing keys aren't considered particularly high security). Of course, you should make sure not to include both the private keystore file and the password in any public code repository. Finally, you're ready to build! AndroidManifest.xml:6: error: Error: No resource found that matches the given name (at 'icon' with value '@drawable/ic_launcher'). it's because older eclipse builds wanted icons named icon.png, while ant wants them named ic_launcher.png. You can fix this either by renaming your icons to res/drawable-hdpi/ic_launcher.png (and the same for res/drawable-lpdi and -mdpi), or by removing everything under bin (rm -rf bin/*) and then editing AndroidManifest.xml. If you don't clear bin before rebuilding, bin/AndroidManifest.xml will take precendence over the AndroidManifest.xml in the root, so you might have to edit both files. Done! So much easier than eclipse, and you can use any editor you want, and check your files into any version control system. I have a bunch of devices that use VFAT filesystems. MP3 players, camera SD cards, SD cards in my Android tablet. I mount them through /etc/fstab, and the files always look executable, so when I ls -f them, they all have asterisks after their names. I don't generally execute files on these devices; I'd prefer the files to have a mode that doesn't make them look executable. I'd like the files to be mode 644 (or 0644 in most programming languages, since it's an octal, or base 8, number). 644 in binary is 110 100 100, or as the Unix ls command puts it, rw-r--r--. There's a directive, fmask, that you can put in fstab entries to control the mode of files when the device is mounted. (Here's Wikipedia's long umask article.) But how do you get from the mode you want the files to be, 644, to the mask? The mask (which corresponds to the umask command) represent the bits you don't want to have set. So, for instance, if you don't want the world-execute bit (1) set, you'd put 1 in the mask. If you don't want the world-write bit (2) set, as you likely don't, put 2 in the mask. So that's already a clue that I'm going to want the rightmost byte to be 3: I don't want files mounted from my MP3 player to be either world writable or executable. But I also don't want to have to puzzle out the details of all nine bits every time I set an fmask. Isn't there some way I can take the mode I want the files to be -- 644 -- and turn them into the mask I'd need to put in /etc/fstab or set as a umask? python -c "print '0%o' % (~(0777 & 0$1) & 0777)"
This takes whatever argument I give to it -- $1 -- and takes only the three rightmost bytes from it, (0777 & 0$1). It takes the bitwise NOT of that, ~. But the result of that is a negative number, and we only want the three rightmost bytes of the result, (result) & 0777, expressed as an octal number -- which we can do in python by printing it as %o. Whew! 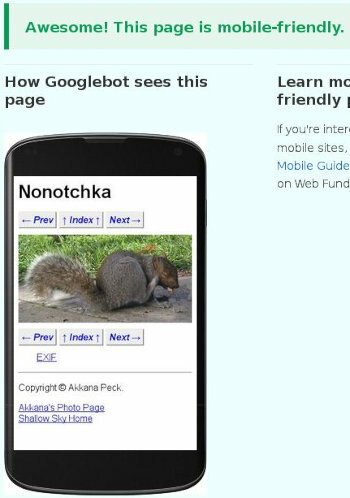 python -c "print '0%o' % (0777 - 0$1)"
I saw on Slashdot that Google is going to start down-rating sites that don't meet its criteria of "mobile-friendly": Are you ready for Google's 'Mobilegeddon' on Tuesday?. And from the the Slashdot discussion, it was pretty clear that Google's definition included some arbitrary hoops to jump through. So I headed over to Google's Mobile-friendly test to check out some of my pages. Now, most of my website seemed to me like it ought to be pretty mobile friendly. It's size agnostic: I don't specify any arbitrary page widths in pixels, so most of my pages can resize down as far as necessary (I was under the impression that was what "responsive design" meant for websites, though I've been doing it for many years and it seems now that "responsive design" includes a whole lot of phone-specific tweaks and elaborate CSS for moving things around based on size.) I also don't set font sizes that might make the page less accessible to someone with vision problems -- or to someone on a small screen with high pixel density. So I was pretty confident. I shouldn't have been. Basically all of my pages failed. And in chasing down some of the problems I've learned a bit about Google's mobile rules, as well as about some weird quirks in how current mobile browsers render websites. What? I wasn't specifying text size at all -- if the text is too small to read with the default font, surely that's a bug in the mobile browser, not a bug in my website. Same with links too close together, when I'm using the browser's default line spacing. But it turned out that the first two points were meaningless. They were just a side effect of that third error: the mobile viewport. 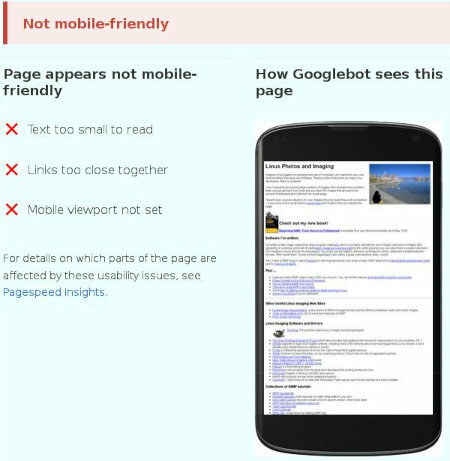 It turns out that any page that doesn't add a new meta tag, called "viewport", will automatically fail Google's mobile friendly test and be downranked accordingly. What's that all about? Apparently it's originally Apple's fault. iPhones, by default, pretend their screen is 980 pixels wide instead of the actual 320 or 640, and render content accordingly, and so they shrink everything down by a factor of 3 (980/320). They do this assuming that most website designers will set a hard limit of 980 pixels (which I've always considered to be bad design) ... and further assuming that their users care more about seeing the beautiful layout of a website than about reading the website's text. And Google apparently felt, at some point during the Android development process, that they should copy Apple in this silly behavior. I'm not sure when Android started doing this; my Android 2.3 Samsung doesn't do it, so it must have happened later than that. Just to be clear, Google is telling us that in order not to have our pages downgraded, we have to add a new tag to every page on the web to tell mobile browsers not to do something silly that they shouldn't have been doing in the first place, and which Google implemented to copy a crazy thing Apple was doing. Documentation on how width and initial-scale relate to each other, and which takes precedence, are scant. Apple's documentation on the meta viewport tag says that setting initial-scale=1 automatically sets width=device-width. That implies that the two are basically equivalent: that they're only different if you want to do something else, like set a page width in pixels (use width=) or set the width to some ratio of the device width other than 1 (use initial-scale=. That means that using initial-scale=1 should imply width=device-width -- yet nearly everyone on the web seems to use both. So I'm doing that, too. Apparently there was once a point to it: some older iPhones had a bug involving switching orientation to landscape mode, and specifying both initial-scale=1 and width=device-width helped, but supposedly that's long since been fixed. initial-scale=2, by the way, sets the viewport to half what it would have been otherwise; so if the width would have been 320, it sets it to 160, so you'll see half as much. Why you'd want to set initial-scale to anything besides 1 in a web page, I don't know. If the width specified by initial-scale conflicts with that specified by width, supposedly iOS browsers will take the larger of the two, while Android won't accept a width directive less than 320, according to Quirks mode: testing Meta viewport. It would be lovely to be able to test this stuff; but my only Android device is running Android 2.3, which doesn't do all this silly zooming out. It does what a sensible small-screen device should do: it shows text at normal, readable size by default, and lets you zoom in or out if you need to. Image pages are all about showing an image. Many of my images are wider than 320 pixels ... and thus get flagged as too wide for the screen. Note the scrollbars, and how you can only see a fraction of the image. I've been using similar CSS in my RSS reader for several months, and I know how much better it made the web, on news sites that insist on using 1600 pixel wide images inline in stories. So I'm happy to add it to my photo pages. 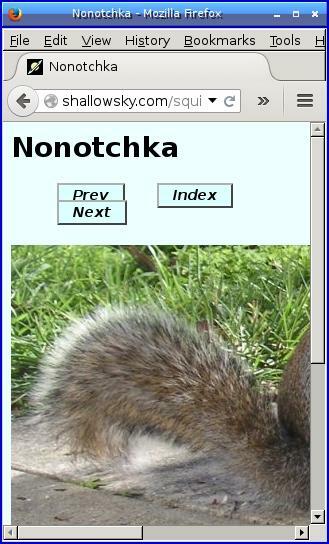 If someone on a mobile browser wants to view every hair in a squirrel's tail, they can still zoom in to the page, or long-press on the image to view it at full resolution. Or rotate to landscape mode. The CSS rule works for those wide page banners too. Or you can use overflow: hidden if the right side of your banner isn't all that important. Anyway, that takes care of the "page too wide" problem. As for the "Links too close together" even after I added the meta viewport tag, that was just plain bad HTML and CSS, showing that I don't do enough testing on different window sizes. I fixed it so the buttons lay out better and don't draw on top of each other on super narrow screens, which I should have done long ago. Likewise for some layout problems I found on my blog. So despite my annoyance with the whole viewport thing, Google's mandate did make me re-examine some pages that really needed fixing, and should have improved my website quite a bit for anyone looking at it on a small screen. I'm glad of that. It'll be a while before I have all my pages converted, especially that business of adding the meta tag to all of them. But readers, if you see usability problems with my site, whether on mobile devices or otherwise, please tell me about them!